Version 1 you say??? 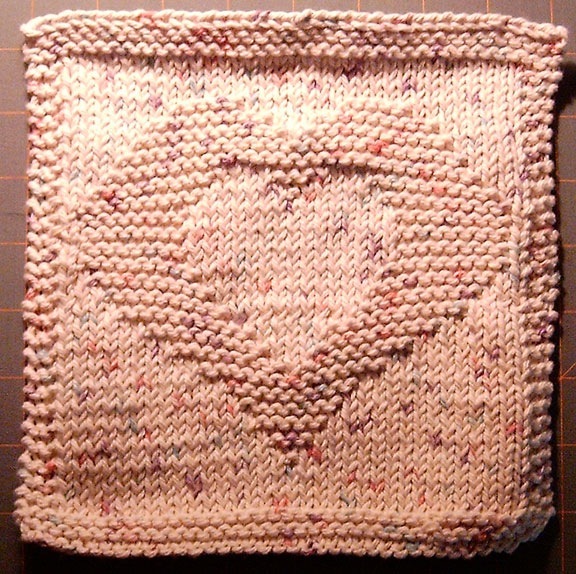 Yup, I’ve picked a few dishcloths to do for my February KAL .. the subject is hearts … and of course when I can’t decide, I just do them all .. and well – these I can knit up in a nite or less .. so I imagine I’ll have a ton of hearts for my feb KAL ..
First one is this dishcloth (it has a matching dishtowel too – which I may or may not get / do) called “Two Hearts as One” Dischloth. Made with Lily sugar n cream potpurri – the as I used in my snowflake dishcloth. Tomorrow I have the house to myself and my intention AND plan is to get moving on my 1800 quilt .. I would love to call that finished .. maybe I’m just to nervous about having the freemotion look to radically different and I’m stalling .. heh .. I’m even working up headband patterns in my head and a dishcloth pattern in my head to avoid this me thinks .. well tomorrow I do this!! How clever, Grace! You are really cranking out the projects. I didn’t comment on the mittens, but I love them!